Benedict-Miller LLC is pleased to announce the addition of a new, NC controlled full automatic metal cutting Amada band saw. This addition expands our existing production capabilities and increases toll-processing opportunities for customer owned materials requiring burr-free saw cutting. 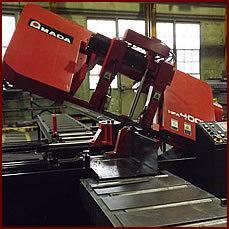 Optimal for carbon and alloy applications, the Amada is capable of cutting a wide variety of materials up to 24" wide including rectangle pipe, tube, bar, and I-beams. Wide flange, angles, and channels can also be processed with the new equipment. Providing better than industry standard lead times and quick turnaround, Benedict-Miller LLC continues its pursuit to be the fastest in the industry with the addition of the Amada band saw. Click here to see a short video showcasing our bar saw cutting service.